Soon after the war he wrote down his adventures, while his memory was still fresh with the events. 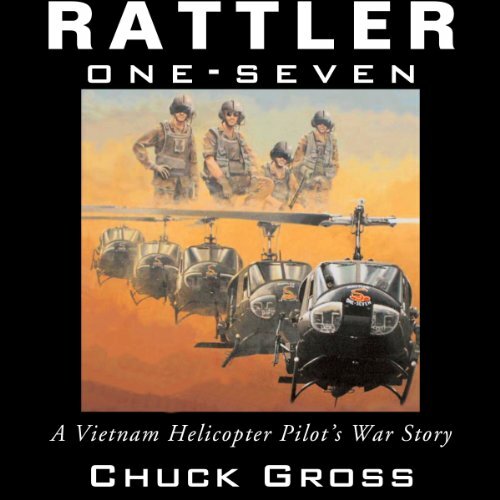 Rattler One-Seven (his call sign) is written as Gross experienced it, using these notes along with letters written home to accurately preserve the mindset he had while in Vietnam. The first Heli book I listened to was Night Stalkers. That was Very informative and at the same time fed my Love for Helicopters. This book Does it all over again. Gross takes his letters he sent home and other things he wrote at the time and reads them as he progresses thru his Army stint in "Nam". He takes you from when he enters the Recruit center and adds the most Exiting and informative days in that time period and puts them in this book. He becomes one of the more revered leaders of his unit that many guys come to look up to. I hesitated b/c of not many people rating this yet but I'm glad I took a chance and got it. It is now one of my Favorites that I will be re listening to for a long time. Not enough substance and very few accounts of actual action. "Chickenhawk" is the definitive book on the subject. This review is limited to the audio version. 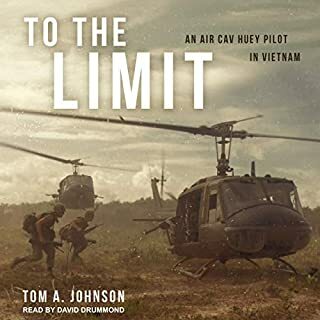 Mispronunciations litter this audiobook butchering both helicopter and military terminology as well as geographic locations, such as the historic city of Huế. I found this distracting as well as disrespectful to the earnest efforts of the author. I don't intend this as nit-picking. I simply expect (and hope) for better from Audible. The audio format calls for adequate preparation by the production team prior to entering the studio, with particular attention to accurate pronunciation. That said, Mr. 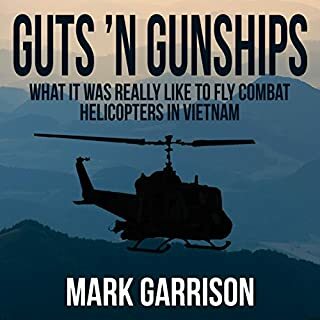 Gross comes across as one of those decent enough sorts, simultaneously coming of age while developing into a competent combat pilot, yet so straight-laced, pious and temperate that he routinely rubbed his commanders the wrong way and alienated himself from his peers. I respect that he was a young man from a somewhat sheltered background placed in a very difficult, life-threatening situation not of his choosing. In this respect, he performed admirably. Still, he seems to have been a bit of an odd-man-out during his brief, but unquestionably heroic, tour of duty in Southeast Asia. I found the story compelling, thank the author for his service and urge interested readers/listeners to purchase and enjoy the book. 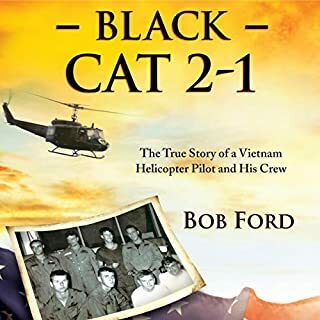 This book's story line is about the experiences of a helicopter pilot in Vietnam. That's fine ... my problem is the narrator. 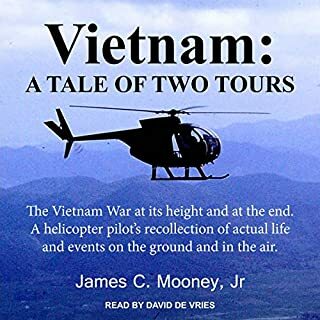 As a helicopter pilot in Vietnam myself, I found narrator Gerry Burke's mis-pronuciation of several words important to the story such as "cyclic" (one of the pilot's controls), and "Hue" (one of the country's earliest capitals and the scene of vicious fighting in 1968) to be extremely off-putting. I was disappointed that neither Mr. Burke, nor publisher University Press Audiobooks, nor Audible took the time to edit the work and ensure correctness of pronunciation. The Huey is an American icon like the P-51 Mustang. I've read many Huey pilot memoirs and this one stands out, found myself terrified at times. It has so many factors involved such as Chuck being only 19yld when his tour started during a time when the Army was reckless with its pilots. You get the thrill of what it's like being shot down during Lam Son 719 (Spring '71) and the incompetence of his officers forgetting about him and not sending a rescue helo. Ken Burns, The Vietnam War Ep. 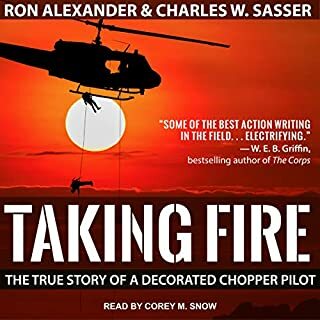 9: A retired Marine Col. wrote in the spring of 1971 "The moral, discipline and battle worthiness of the US Armed Forces are lower and worse than at any time, possibly in the history of the United States" Chuck describes vividly every encounter and even his fellow pilots stories during debrief. Reviewers complain he was lame but fail to realize that Chuck was 19, religious, disciplined with morals which is why he refused troops throwing a VC POW out of his Huey after an extraction. He's highly intelligent when it comes to aviation, eventually became a 767 Captain. He explains principles of flying a helo like I've never heard before and how he corrected many terrifying in-flight emergencies. 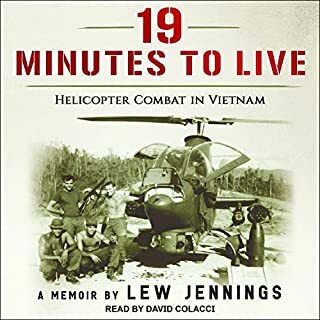 The second half of the book is mainly the prepping and assault into Laos (Lam Son 719) which to this day is still the largest and costliest helo assault in the world. I really enjoyed listing to this book and find it very similar to Guts 'N Gunships. The Huey squads of the late 60's were worlds apart from the early 70's when the war was getting out of control. Amazed the amount of drinking that went on before a sortie. I found the book to be extremely well written and the time line well laid out. I'd highly recommend this book to anyone and everyone. is indebted to them all. Good story over all but lacks the in-depth descriptions of the actual missions of flying in and out of the LZ's and other combat action. So, before I say anymore, go ahead and get it. Overall it is a great read or listen. It is a very balanced (between story telling and technical details) memoir that goes by very quickly as it is pretty well written. The only downside of the story is that the author very often paints himself as the perfectly balanced hero in all of the situations which I found a little tiring by the middle of the book. The narration is classic Audible, which is to say, pretty amateurish. I can't believe that nobody proof listens to this stuff. The narrator pronounced rations as "rayshuns" and the city of Hue as "Hue" as in the color not like "whey" which even a cursory visit to Wikipedia would have corrected. One chapter about the city was almost unlistenable due to how may times he called it Hue. Having said all that, it is still a very good book overall. I enjoyed this book. Gave a good look at what was going on in the war. I have a great love of flying and especially helicopters. I have always loved the Huey and always had a respect for the pilots that flu them in the Vietnam war.I really enjoyed sharing the ride and feeling how it would’ve been hanging your arse out in the breeze to be shot at and still maintaining a level head. Much respect to you all.